Working with hazardous chemicals can be one of the most dangerous activities for workers to engage in for a number of reasons; not the least of which being that many chemicals used in production are used in small quantities, meaning that they last a while between re-stocks and workers don’t have to handle them constantly. While this might seem like a plus, it can mean that workers get rusty on training and handling in between shipments, creating added risk when a new container arrives. Additionally, chemicals are unique in that many substances can pose both long term and short terms risks – some chemicals might increase the chance of developing cancer when inhaled, and may also be corrosive and cause burning when in contact with the skin or eyes. One of the first, and most important, aspects of chemical safety begins at the origin; if you’re going to be the one producing a chemical for industrial use, you need to follow strict guidelines for the packaging and labeling of your substances before sending them out to clients. Containment: Your first priority should always be appropriate containment of your chemicals. Container material should not, in any circumstance, be able to be eroded or worn down by the chemical it contains. This needs to hold true even if the chemical is going to be transported long distance or if it’s going to sit in place for 10 years. All seals should be tight enough to prevent leakage and lids should fit snugly – ideally, chemical containers will also have some sort of locking mechanism. Labeling: After primary containment, adhering to the appropriate Safety Data Sheet (SDS) specifications becomes your number one priority. Safety data sheets not only ensure you keep track of your own materials, but are meant to make sure those transporting and receiving your materials are well aware of what they’re handling at all times. All hazardous materials should have a GHS label to communicate the type of chemical hazard each container contains. The GHS labels can be printed using an industrial label maker which allows all products to be properly labeled. Section 1: Section one is a general overview of the vitals. Here you’ll include the chemical identifier/name and manufactured or distributor name, along with their address, phone number, and any other contact information. Emergency numbers and important restrictions on use should also be included here. Section 2: This is the section for hazardous warnings. They should be stated completely but also in such a way that is easy to understand. 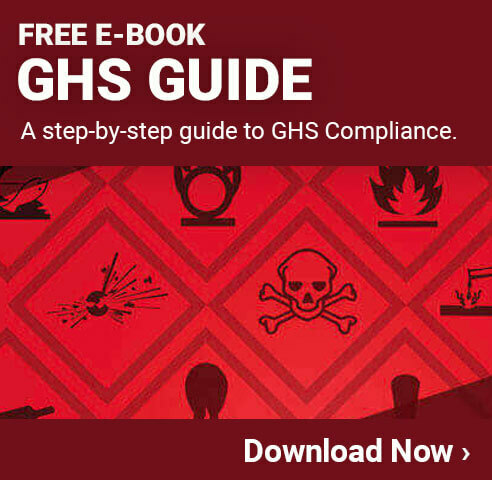 Any risks associated with your chemical, starting with bodily/human injury and illness and finishing with others (such as property/clothing damage, etc.). Section 3: Ingredients. Anything that went into creating the substance you’re shipping needs to be disclosed here in full – there are no secrets when it comes to chemical handling and safety. Section 4: First Aid. If an employee is exposed to the chemical unmitigated by appropriate PPE, what will their symptoms be in the short term? The long term? Include appropriate first aid measures that should be taken if a worker is exposed. In addition to first aid, specify any relevant hospital treatments. Section 5: Fire-fighting. Is your substance flammable? Tell recipients all about it in section five. Explain how to prevent fires as well as how to extinguish them. Specify any required additional equipment for fire-fighting here. Section 6: Protection. Specify here emergency procedures for containment and cleanup in the event of a spill. Include specifications for protective employee equipment here as well. Section 7: Handling/storage: Any precautions for handling the chemical safely should be listed here, along with information on how to store it. Make sure to state any chemicals, substances, or materials that your product should not be stored with. Section 8: Exposure limits. Listing the regulated allowable parts per million exposure for human beings to your chemical substance should be done here (in some cases the use of other units may be more appropriate). Officially, eight-section sheets fulfill the requirement for most U.S. SDS policies, but many SDS’ will have 9 sections, and sometimes more. Chemical safety primarily comes down to the same common sense and protective measures that go into other safety programs. However, you should give specific attention to the following areas. PPE: Protection equipment needs to be even more carefully considered when it comes to chemicals. Respirators must be effective and graded for the substances being used, and other equipment (gloves, clothing, etc.) need to be liquid resistant and not allow anything through. Handling Procedures: When working with flammable, combustible, or corrosive materials, workers need to follow a strict, outlined procedure for handling and movement of substances. Drums and containers should never be transported on forklifts, pallet jacks, or carts without being secured with straps or other appropriate restraint types. Other than that, most chemical safety, at least on the employee end of things, comes down to reading labels carefully and behaving accordingly. Workers should also be able to refer to a written chemical safety plan you’ve set out for them.